A luxury home community set in the hills of Georgetown, Texas. 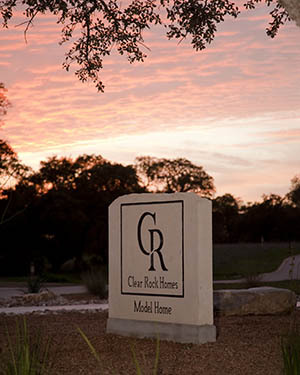 Offering one-acre home sites nestled in a picturesque setting with the brilliant rolling Hill Country views. Couple this charming setting with a one-of-a-kind, custom built home by Clear Rock Homes, and you have the perfect combination of Texas Hill Country elegance. Homes are priced from $500,000 to $800,000+. Homes sizes range from 2,500 square feet to over 4,000 square feet. Come visit our newly opened Model Home located in The Ridge at Cross Creek at 200 Creek Crossing Drive. See our Location Map for directions.